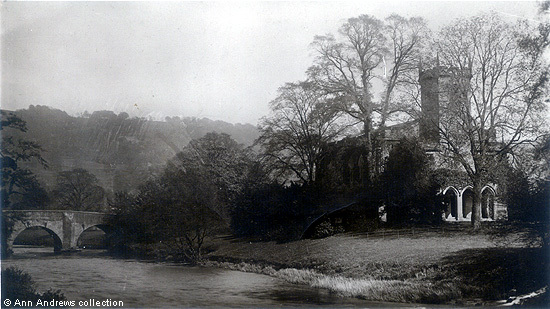 St. Mary's Chapel in Cromford is on the opposite bank of the River Derwent from Willersley Castle. The river acts as the parish boundary. The church was commissioned by Sir Richard Arkwright and the building work completed by his son. It is the burial place of several members of Arkwright family, including Frederic George Alleyne Arkwright who died during World War One. Sir Richard Arkwright was buried first at Matlock but was later re-interred here. The new chapel is dedicated to St. Mary, and it is said that it herein followed the dedication of its predecessor, but of that we have no satisfactory proof. The chapel, or church as it may now be termed, when originally erected by Mr. Arkwright, partook of the plain characteristics of that time, and was destitute of a chancel, It was lighted by a double tier of five windows, circular-headed, and having cast-iron frames. In 1858-9, it was greatly improved and "gothicised," by cutting down the two rows of windows into one, and dividing them with stone mullions and tracery. At the same time a new chancel was added, the west portico built, and the galleries and flat ceiling of the interior removed. The extent of these alterations, although the ground plan and walls of the 1797 chapel still remain, may be gathered from the fact that they cost the late Peter Arkwright, Esq", the sum of £3,000.
" Edward Arnold fecit. Leicester, 1796. "  Add. MSS., 6,666, ff, 355, 357." Richard Arkwright endowed St. Mary's with £50 in 1797. The sum was later augmented by a further £200 from Mr. Arkwright, £200 from Queen Anne's bounty, a Parliamentary grant of £800 and another £200 in 1826.
of St. Mary's from the County bridge. A subscription list was opened in 1888 as a way of raising funds to light St. Mary's with gas. The church closed at the end of 1896 for further improvements, replacing the old chancel arch with one considerably wider and the flooring with "vetrious mosaic". New carved oak choir stalls were installed, the vestries improved and two new windows were added. The roof and seating were also renovated and the pulpit, which was said to have been ugly, was enhanced. The stained glass and the wall painting was done by Mr. A. O. Hemming, a well known church artist of the day. The renovation was carried out under the direction of Derby architects Messrs. Naylor and Sale. It was re-opened in April 1898, when the Bishop of Southwell dedicated the gifts to the church. The acoustics were said to be considerably better as a result of the work. The message, written across the back of the top card, reads: "This is typical of the village church found in the villages of England. Cromford is about 22 miles North of Ticknall and is a most lovely old fashioned place. Hosiery and Silk are manufactured here". The sender of Tom Henshall's photographic postcard wrote the following message on 31 May 1909: "came here by the 1.10 train and are having a good time. We have done plenty of climbing, up Jacob's Heights & been on the switchback. It was grand. We are sitting opposite the river watching the rowing boats". It is possible that, after climbing Jacob's Ladder, they visited the Fluor Spar Cavern on the Heights of Jacob and bought this card from the Henshalls. 1. "Cromford Church and Bridge". No publisher. No. 1872. Printed in England. Not posted. 2. "Cromford Church, Matlock Bath". Photographed, published and printed by TMH (Thomas Meredith Henshall). 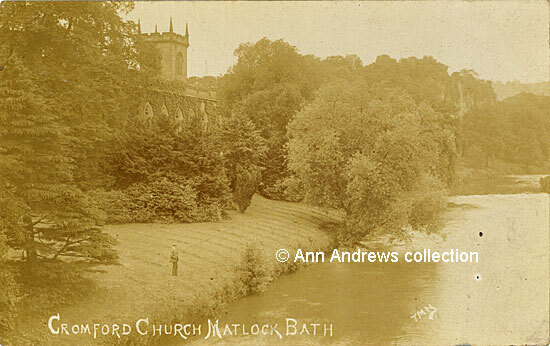 Posted 1 Jun 1909 in Matlock Bath. Cox, J Charles (1877) "Notes on the Churches of Derbyshire Vol II" Chesterfield: Palmer and Edmunds, London: Bemrose and Sons, 10 Paternoster Buildings; and Derby. Glover, Stephen (1833) "The History and Gazetteer of the County of Derby ..." Edited by T. Noble. pub. Derby and London. "Derbyshire Times", 21 April 1888. Extract from "The Beauties of England and Wales" (1802), written shortly after his death, which describes of cotton manufacturing and has more on the mills, Willersley Castle (plus an engraving), Sir Richard Arkwright and the area surrounding Willersley.